There is a media company that sends me books to review. I choose from titles they make available. 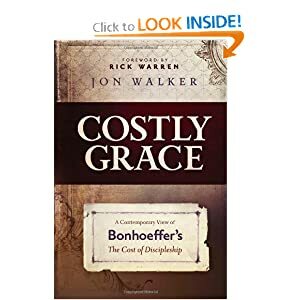 Recently they made Costly Grace: A Contemporary View of Bonhoeffer’s The Cost of Discipleship by Jon Walker available. I’ve read The Cost of Discipleship a few times, and I was curious to see what he had done with it. I have not yet completed the book (I have less than 100 pages to go), but the deadline looms. I don’t think anything in the rest of the book will fundamentally change the review. First an observation. With the downturn in the economy, editors must have been on the low priority list. The text was laden with errors leading me to believe it hadn’t been proofed. This is a trend I’ve noticed lately. This goes beyond the misuse of apostrophes. Wrong words are used or words are repeated. Note to publishers- the computer won’t help you find and correct many errors. Hire someone who can read! Okay, back to our regularly scheduled programming. The whiny man on the grammatical soapbox has been sacked. Walker follows the pattern of Bohnoeffer’s classic book. He starts off with a quote from Bonhoeffer’s chapter, the passage of Scripture used and then interacts with Bonhoeffer. He’s not critical of Bonhoeffer, at least in any significant way. He’s trying to make it more accessible, and in touch with contemporary concerns. At the end of the chapter he has some helpful bullet points. He has a summary statement followed by examples of “fallen thinking” & “kingdom thinking”. It ends with the call to choose, a way to apply the truth covered in the chapter. It is a readable (aside from textual errors) (the one responsible for sacking those responsible has also been sacked), updated treatment of Bonhoeffer’s book. It doesn’t add anything significant. It isn’t concerned with wrestling with the validity of Bonhoeffer’s conclusions or arguments. In other words this is not a critical treatment of Bonhoeffer’s book (both positive or negative). While I was at General Assembly, See Jesus provided a free copy of A Praying Life discussion guide. I had been wanting to read the book, and a friend graciously & generously purchased me a copy of A Praying Life by Paul Miller (it’s also available in audio book form). One (all?) of the community groups here at Desert Springs is going through Paul Tripp’s Instruments in the Redeemer’s Hands: People in Need of Change Helping People in Need of Change. I guess that is one of the reasons I see this congregation as a great fit for me. I’d have recommended this material, and they are already studying it. It is a book I read during my transition period. I posted some thoughts on it. I decided to bring it home with me last night to review. Yes, most of my books are now out of boxes. When you go back to something you can often wonder why you liked it in the first place. But this is one of those times you are reminded just how thoughtful and profound a book is. Paul Tripp is one of those guys more Christians need to read. That he has been a serious student of Scripture for a long time is evident as you read his books. In the opening chapters I (re)discovered material suitable for my sermon Sunday and my upcoming series on Genesis. You can read the first chapter here. Here are some thoughts from the first few chapters, and the preface. This is a great summary of what good pastors want to tell their people, often. We are shaped by the ministry of the Word, both public and private or personal. It is not enough to show up- but to engage with the Word by believing it and acting upon it. One of the things I appreciate the most about this book is its call to do just that. He has a very Word-centered view of ministry, for it is there that we meet with the Living Word- Jesus Himself.